Gallery Night is approaching fast and I have to make The Last Big Push to have work ready in time. I was able to unload a kiln saturday and noticed a few tests turned out great so I…keep fingers crossed…am glazing a good bit of work with these new glaze combinations. I finally have some good reds and purples i’ve been looking for so I’ll try those out on my next firing for the Bowl Series. Wish me luck! 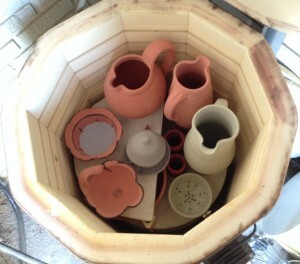 New kiln load glazed and loaded. I fired this last night and will open early friday morning…fingers crossed!